- Publisher From common origins, both African and Middle Eastern, Christian monasticism travels along two parallel streams, branched and informed by mutual influences: the Eastern and the Western. In The Historical Atlas of Eastern and Western Christian Monasticism historians have collaborated to examine the history of Christianity and provide a work of reference where East and West meet and are mutually enriched. The Atlas brings together many voices speaking from different influences. Russians, Serbians, Bulgarians, Greeks, Latins, Anglo-Saxons, Americans, Germans, and others, serve at the same time as co-authors and readers of a diverse reality that is a common property of Christianity. The Historical Atlas of Eastern and Western Christian Monasticism bears witness the twofold Christian paradox: on the one hand, "being in the world without being worldly, " while the very monastics who have most fully embodied that statement also show us the other side of the paradox, namely, that monasticism has changed the world and even its natural and cultural landscape. Without centuries of monasticism the world would be a different place. Through its engaging text and use of 59 full-color illustrated maps to detail specific locations of important places and events, the Atlas points out some of the religious goals and thoughts most pursued and most clearly present in the great representatives of the surprising and moving history of monasticism. 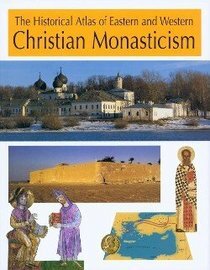 Chapters are "Universality of the Monastic Phenomenon, " "The Origins of Christian Monasticism, " "Early Christian Monasticism, " "The Western Monastic Tradition, " "Development of Monasticism in the East, " "Development of Monasticism in the West, " "A Millennium ofChristian Monasticism in the East, " and "A Millennium of Christian Monasticism in the West." About "The Historical Atlas of Eastern and Western Christian Monasticism"
From common origins, both African and Middle Eastern, Christian monasticism travels along two parallel streams, branched and informed by mutual influences: the Eastern and the Western. In The Historical Atlas of Eastern and Western Christian Monasticism historians have collaborated to examine the history of Christianity and provide a work of reference where East and West meet and are mutually enriched. The Atlas brings together many voices speaking from different influences. Russians, Serbians, Bulgarians, Greeks, Latins, Anglo-Saxons, Americans, Germans, and others, serve at the same time as co-authors and readers of a diverse reality that is a common property of Christianity. The Historical Atlas of Eastern and Western Christian Monasticism bears witness the twofold Christian paradox: on the one hand, "being in the world without being worldly, " while the very monastics who have most fully embodied that statement also show us the other side of the paradox, namely, that monasticism has changed the world and even its natural and cultural landscape. Without centuries of monasticism the world would be a different place. Through its engaging text and use of 59 full-color illustrated maps to detail specific locations of important places and events, the Atlas points out some of the religious goals and thoughts most pursued and most clearly present in the great representatives of the surprising and moving history of monasticism. Chapters are "Universality of the Monastic Phenomenon, " "The Origins of Christian Monasticism, " "Early Christian Monasticism, " "The Western Monastic Tradition, " "Development of Monasticism in the East, " "Development of Monasticism in the West, " "A Millennium ofChristian Monasticism in the East, " and "A Millennium of Christian Monasticism in the West." Laboa was born in Pasajes de san Juan, Guipuzcoa, Spain. He has graduated in philosophy and theology and holds a doctorate in church history from the Gregorian University in Rome and a degree in history from the University Complutense in Madrid.